I have recently uploaded the initial release for the successor (replacement) to Extra Bars called Button Forge. Button forge addresses several of the problems present in Extra Bars (such as Companions sometimes causing an error at first login, poor performance in certain scenerios etc), perhaps the biggest change is the ability to create as many or few bars and buttons as you choose. Adds 4 extra action bar you can drag abilities, items, macros, mounts and critters to. This bar will not alter your existing actionbars or other user interface elements in anyway. To provide additional action bars to the user interface with as little learning curve or time spent configuring as possible. To add buttons drag them from your inventory, spell book, macro's tab, or from other buttons into the button you want them in. Notice: This mod is in beta, I will try to deal with any issues that arise as I have time but please feel free to list issues if they occur. Buttonfacade or other skinning addon support ?!? 19-Dec-2009 v0.7.4 - Fixed issue preventing a few certain mounts and pets not activating when clicked (most notably the Bronze Protodrake). Hi I've just uploaded a significant (though in a lot of ways subtle) update. This version should get Extra Bars back up and running. It adds support for the additional specialisations. Corrects the issues with Mounts, and also fixes some issues with cooldowns. There may be teething problems requiring further releases, so I'll be keeping an eye out. Just an fyi, that I am planning to get an update out to support Legion (I've just done some updating on ButtonForge). if I have time hopefully something later today - otherwise in the next day or two. So the next expansion is just about upon us, so I figured I'd take the moment to do a blog post about Extra Bars and WoW. Although I created Button Forge to replace Extra Bars which I had planned to desupport in time, I discovered there were a number of players who preferred the very straight forward nature of Extra Bars (and others who had found inventive ways of using it that Button Forge didn't do). So while I see people are still downloading EB, I'll consider it something worth my time to keep working... Although I don't intend any major new features, I know some cleanup is still required to the UI (that faint glowy config button in particular - it seemed like a good idea at the time :$ ). Last edited by Alternator : 10-29-14 at 02:29 AM. I've just uploaded v0.7.18 as yesterdays upload may have still caused problems for some people. The first time you logon with this version it will clear your mounts and battlepets from the extrabars as WoW uses new values to track these and I wasn't able to map them (in the case of battlepets it potentially would cause outright errors); but you should be able to add them back on and be good to go again. p.s. I'll try and post a bit of an update on me and my plans regarding Extra Bars - but the tldr will be I hope to continue to support it through WoD and improve a few outstanding issues in it as time permits. Last edited by Alternator : 10-15-14 at 05:05 AM. I would like to know if there is a way to hide the faint icon which can be found at the top right corner of each bar ? 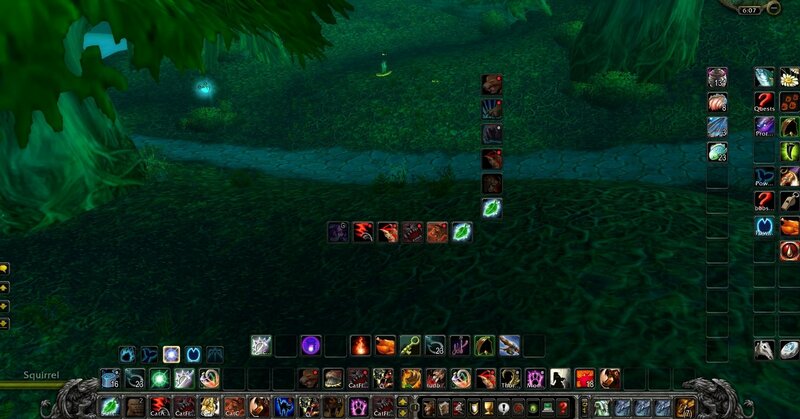 Hi, just a quick update to get WoW v5.3 to recognise Extra Bars as a current addon. I got a bit delayed on providing this. Just a quick update to prevent the Extra Bars appearing while in a pet battle. is it possible to hide the drag thing? when I lock the bars, its still visible. It isn't possible currently, but it is something I could look at altering, I'm not too sure when the next feature change for Extra Bars will be though (I'm currently, slowly getting a new v of Button Forge ready). Last edited by Tolchock : 01-07-13 at 05:05 PM. I've uploaded a version for v5.1 of WoW. I've also added support for Battle pets so you should now be able to add them to the Extra Bars. This is just a confirm that I will be updating Extra Bars hopefully in the next 24hrs (I've run out of time tonight) - I expect that errors will occur when Battlepets are on the bar, but if you get other issues please let me know. Hey thanks for the comments and apologies for the slow reply. Glauck, at the moment there isn't the ability to have fully red buttons on range, and unfortunately range addons aren't able to interact with this addon. This is an often requested feature for Button Forge and something I can hopefully add to it sooner rather than later - if it proves to be fairly straight forward I should also be able to port the option to Extra Bars.